Performing arts is a form of creative expression, most typically performed in front of a live audience. Participating in performing arts gives young students a creative outlet that also benefits their personal and academic well being, even through casual exposure. However, high school students at Denali have found that the opportunities in performing arts offered are inadequate, especially compared to the programs available at the middle school campus. Performing arts programs can potentially improve focus and discipline, develop critical thinking and decision-making skills and improve memory and concentration. These programs also promote the development of social skills for many students. Programs involving performing arts in education provide students with opportunities to engage their body, mind and emotions, exploring themes and ideas about humanity. “There is a lot of different classes kids can go to, and a lot of them are a lot different than what kids normally do – for example, Stage Combat … It’s definitely a start if you want to pursue a career in that field, but it’s not the highest quality,” Charles Cassel, a Denali freshman, commented regarding the performing arts opportunities offered by Denali. Stage Combat is one of the only ways that Denali students interact with the performing arts. 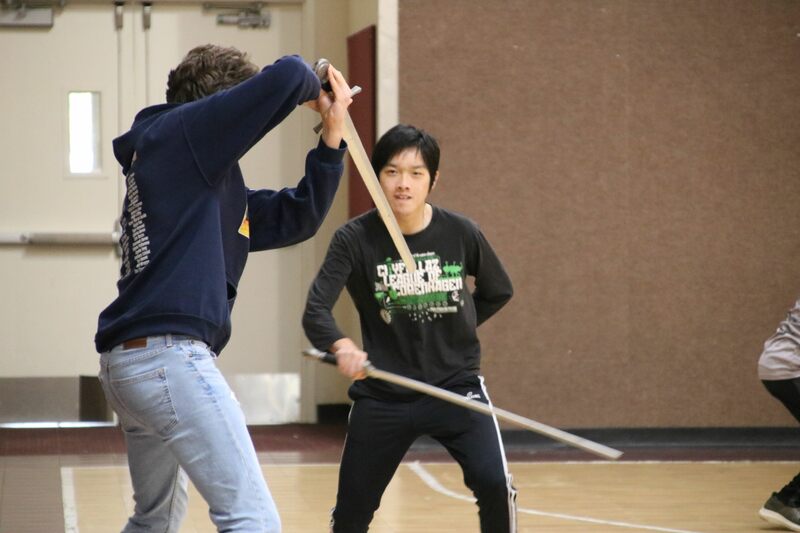 Stage Combat is a course where students learn about fight choreography and the illusion of real physical contact, weapon techniques and how performing arts addresses oppression. In the first round of Expeditions, students learned how to choreograph unique fight scenes. In the second round, they learned longsword techniques to practice fight scenes with weaponry. Students in the third round will act out a story where the audience will participate, furthering both the actors’ and the audience’s critical thinking and prompt decision-making skills. “One critique is that Summit Denali is very STEM-focused, so sometimes some of the other subjects cannot get focus. I see that in how the other Expeditions courses cannot offer a visual or performing arts credit. Performing arts gives students a place to express themselves that they don’t normally get to do,” Keith Brown, the Stage Combat teacher, said regarding Denali’s prioritization of science, technology, engineering and math compared to their focus, or lack thereof, on the arts. Students involved in the Stage Combat class are given a new perspective on the more thoughtful, purposeful side of performing arts, as well as being given a creative outlet. However, as the class is the only performing arts focused class offered to students, those not enrolled will miss the creative expression offered by Mr. Brown’s curriculum. The theater program was another way students at Denali were exposed to performing arts. When the high school changed campuses, it wasn’t feasible for the program to stay available for high schoolers. High school students who had participated in the Denali theater program felt that the change affected their relationship with the middle school and their ties to the rest of the Summit Denali community. Those involved in the theater program at Denali also sponsored an improv class to prepare actors. The campus change also meant the loss of the improv program, which helped promote quick decision-making and build connections with other actors. “It will allow the students who enjoy the performing arts to express themselves through the art of theater! But it’s also a way to gain more community and, whenever I do shows, you always get really close with the people in the cast and that will make the campus more connected,” Denali sophomore Emma Smith explained. For many students involved in performing arts, it is a way for them to express themselves and make community ties. As Denali does not offer performing arts extracurricular opportunities at the high school, there is simply no other way to expose students at Denali to performing arts and all of its benefits besides their Expeditions courses. According to students and teachers, Denali’s lack of opportunities for performing arts exposure or involvement does not benefit students or the Denali community.